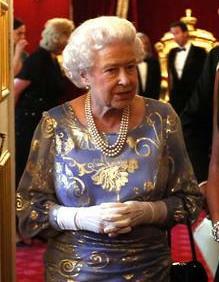 The Queen attended a gala reception for the Royal National Institute of Blind People at St James' Palace. Click here for an article and gallery. You might recognize this dress from the pre-wedding dinner for William and Kate's wedding. I think it was better matched to the gold and diamond jewelry she wore that night than to this pearl option (a longer three strand necklace plus the Duchess of Teck earrings) but I won't give her a hard time: poor HM was without her beau for the night, as the DoE is under the weather. Supposedly he'll be all better for tomorrow's coronation anniversary service, so let's hope that holds true.